A highlight of the weekend was The Great Charlotte Brontë Debate on the Saturday evening (11 June) of the Summer Festival. Which is Brontë's greatest novel, Jane Eyre or Villette? Claire Harman (who had given that morning's lecture) and Joanne Harris argued for Jane Eyre, Lucy Hughes-Hallett and Katherine Langrish for Villette, expertly chaired by Tracy Chevalier. 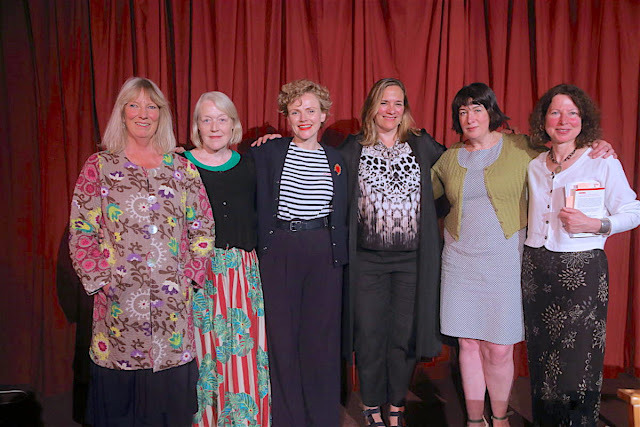 Each writer's defence of her chosen novel was preceded by readings given by Maxine Peake, in which we heard, for example, about Jane in the Red Room, Jane in the early days at Thornfield longing for a more fulfilling and intellectually stimulating life, and Lucy, at the Pensionnat, similarly yearning for a fuller life to lead her 'upwards and onwards'. This first round of presentation was followed by a lively debate in which further points were discussed, after which it was over to the audience. Jane Eyre came out top in the votes taken both before and after the debate, but the second vote revealed a significant swing in support for Charlotte's last novel. All four speakers were so eloquent, however, it's difficult to say which of them mounted the best defence. And I imagine many of us find it almost impossible to choose between Charlotte's best-seller, a novel first read and loved in youth, and the more complex novel we appreciate when we're a little older. As Katherine Langrish put it, if Jane Eyre is Pride and Prejudice, Villette is Persuasion. This was a wonderful event, professionally presented, with six high-calibre performers and a great format. Could we please have many more such debates at Haworth in future? The Annual Brontë Society Lecture this year was delivered by Claire Harman in a venue relatively new to the occasion - the Hall Green Baptist Chapel. The annual church service followed it, in the same place. This was because St Michael's and All Angel's is currently still being reordered and reroofed. Charlotte Brontë - A Life seems to have been read by a large percentage of the appreciative audience, though the queue for signed copies stretched around the church. "Her protagonist is both fervent dreamer and cool realist, imaginative artist and clear-eyed professional," wrote Kathryn Hughes in her Observer review last year, and the clear-eyed Claire Harman showed just why that is an accurate assessment of her work, which moves on significantly from Gaskell (naturally) and also from more recent biographers like Juliet Barker. 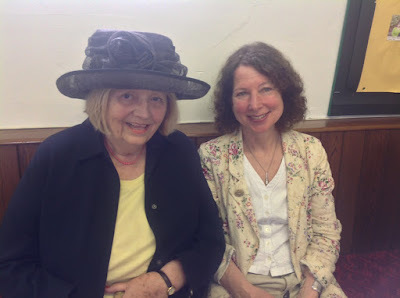 In the photo, she is sitting with Audrey Hall, a leading authority on Ellen Nussey, and who recently became one of the Society's Honorary Vice-Presidents. Charlotte - The Movie is a film commissioned for Charlotte's bicentenary, and it premiered at West Lane Baptist Church on the Friday evening of the June Weekend/Summer Festival. Performed by Lip Service Theatre Company , an outfit very well known to most of the substantial audience because of its live shows (there was a call for hands up), it was made in the Parsonage and nearby with the enthusiastic assistance of the staff. Maggie Fox and Sue Ryding (pictured), who in various guises took all the main parts, from Mrs Gaskell to Robert Redford, have been writing and performing together since 1985, with eighteen original comedies for the stage, a comedy series on Radio 4 and a number of television appearances to their credit. They more than lived up to the description of them by a Guardian reviewer a few years ago - "The Laurel and Hardy of literary deconstruction". There were excerpts from their long-running stage show Withering Looks, but this was several steps on from all that. The laughter at the introduction (in English followed by Japanese) and the opening scene in the Parsonage Dining Room ("Don't sit on that couch!") continued right through to the final gags about submitting the film for the Sundance Festival. The studied naivety, the in-jokes and the child-like glee went down well, and the quiz papers dished out afterwards (sadly, hardly anyone knew that Queen Victoria's middle name was Alexandrina) provided a good excuse to chat with the audience, to soak in a few comments. Both Maggie and Sue were certainly on edge before the screening, but much more relaxed after they had heard the reactions. The only (slight) irritation appears to have been that people laughed too much, which meant that they sometimes missed the witticism which was next in line. These things can be timed better with the punters live in front of you. Friday 10 June was the first day of what used to be called either 'AGM Weekend' or 'June Weekend' but which has now been renamed 'Summer Festival'. 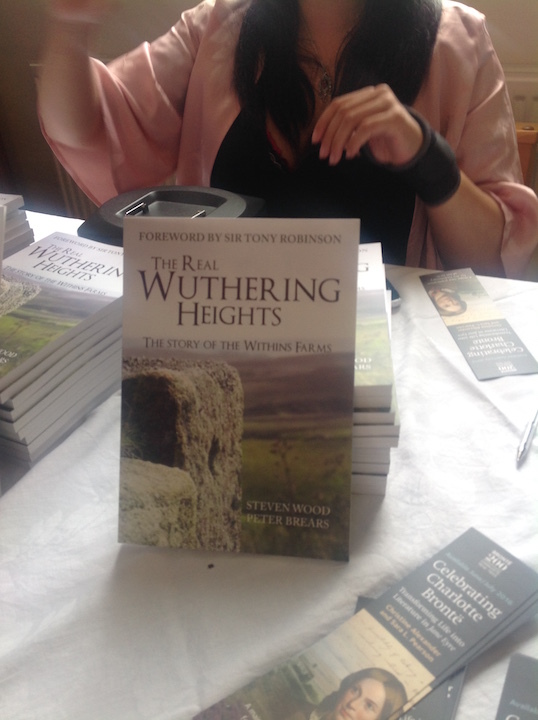 At 3pm first Steve Woods, then Peter Brears gave their illustrated talk 'The Real Wuthering Heights: The Story of the Withins Farms', which was a bigger and better version of a talk given on the same subject three years ago. It began with a brief reference to the letter from publishers Smith, Elder & Co to Ellen Nussey, who was being asked for clues about locations. They wanted to know what the Brontë Sisters had in mind because they were producing the first illustrated edition of the collected works, and Volume Five (1873) of this was Wuthering Heights along with Agnes Grey. As Ellen Nussey's reply has been lost, we do not know much for sure, but the book included an illustration of Top Withins by E M Wimperis which she seems to have suggested to him, so there is some evidence that it was one of the places in Emily's imagination - along with others. The talk was the result of years of careful study, and covered Top, Middle and Lower Withins, three farms which made up about a hundred acres, much of it rough pasture and much of it probably never used - too rough perhaps. Most farms in the area were dairy, producing milk, butter and a little cheese. Two hundred years ago this would have been consumed by the many weavers and spinners in the area - and because it was not much of a living, the farmers and their families would have done plenty of carding and spinning themselves. There were some sheep, and about half a dozen cows at each farm. It would have been an isolated life, with long walks down to Stanbury or Haworth, unpleasant and hazardous in bad weather, especially in heavy snow, and especially for any children on their way to school and back in the later years of the nineteenth century. 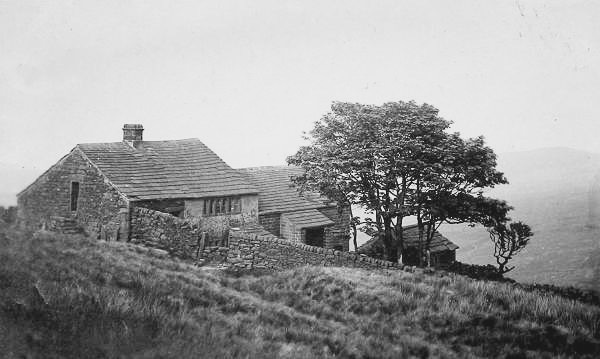 The ruined Lower Withins was finally demolished in the 1930s ("There were plenty of Brontë enthusiasts taking away souvenirs") and Top Withins was fixed into its present state fairly recently, though it seems to have been still quite substantial in the 1920s.